We reported the launch of Southern Wind’s new 31.42m 102 DS series, Hevea, in February and now she's delivered and readying for her 7,500-nautical mile maiden voyage from South Africa to the Mediterranean. A successor to the popular SW 100 DS series, the SW 102 DS is a composite sailing yacht with naval architecture by Farr Yacht Design and general design, exterior and interior styling by Nauta Design. The first hull, called Almagores II, was launched in May 2012 and was one of the finalists in the World Superyacht Awards 2013. 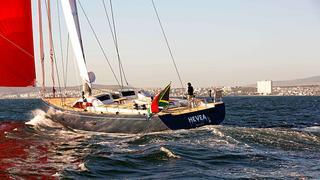 Compared to her sister, Hevea has a standard layout with the owner's suite forward, and the crew area aft. Her sophisticated interior accommodates eight guests in four cabins: a master suite, a VIP and two twins. Hevea will be on display at the Monaco Yacht Show in September 2013.